My husband and I need deadlines to motivate us to finish new work. This week we had to hustle to finish some walnut pieces for a woodworkers gallery show. Deadlines help us stop thinking and get it done! The striped polymer inlay idea has been marinating since I took a class with Carol Blackburn in Santa Fe where she taught us to make big sheets of variegated colors. If I seemed distracted this week, it’s because I was awash in color. Here’s my husband’s complex turning project. One of the first bowls I ever inlaid was in a weeklong class on Whidbey Island with Gwen Gibson who passed away this week. She was a marvelous artist and a lovely person with a huge sense of style and a generous heart. PolymerArtArchive chronicles several periods of Gwen’s works. Read about her early work, her wall pieces and her cuff bracelets. La Cascade, her home in Durfort, France remains a jewel that draws artists from all over the globe. We will miss Gwen and were lucky to have her creative spirit among us. 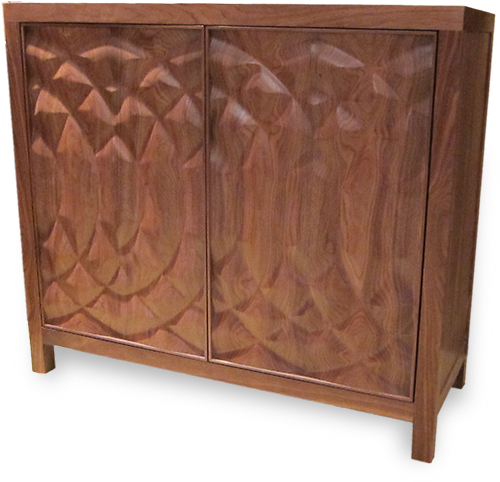 I love the way wood and polymer create a soft, warm harmony ! I am so sorry to hear that Gwen is no longer with us. I had the great fortune to have met her and taken a class with her at Arrowmont in ’97 and she was a fabulous, talented, lovely, generous person. Her work was immensely inspiring. I have a pair of earrings that she designed – I treasure them all the more dearly now. I met Gwen at Arrowmont during the first national PC convention and have been in awe of her skills and innovations ever since. She has definitely left a lasting impression on me and the work I produce. She will live forever tangibilty in the collection of beautiful pieces she leaves behind and spiritually in the people she has touched along her journey on this earth. May we all encompass her spirit and pass it along as we share, mentor and create in this wonderful world of polymer. Good bye to this most elegant lady. Hi Cynthia. First, the bowl is gorgeous! Second, I was shocked and saddened to learn of Gwen’s death. She taught me polymer through her wonderful videos. Do you know if her retreat in France will remain open? It has been one of my goals to take a workshop there one day. I’m sorry I’ll not get to meet her personally. Yes La Cascade remains open and has wonderful workshops lined up for 2014. Go to http://www.gwengibson.com and click on the La Cascade schedule. Come join us there! 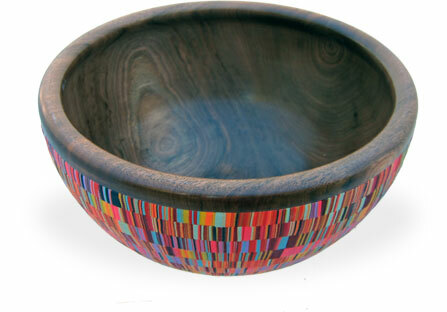 Your bowl is stunning!!!! The colours just keep my eyes wandering around the shape. Would love to see your other pieces too. Please show and tell. It’s sad to hear about Gwen’s passing. I have never met her, however her work has popped up so often in my polymer researches. She will be fondly remembered as a member of the global polymer community. I too was surprised to hear of her passing. She brought so much to the world of polymer clay, and the world will be missing out without her creations. I have such great memories of Gwen. My favorite – walking on the beach at Whidbey and talking about how she was exploring polymer clay as a curving canvas. She thought of polymer as a malleable surface for screen printing and a worked with it in a fascinating new way that transformed flatness into 3D. I think she would have loved your bowl, Cynthia. It’s gorgeous! 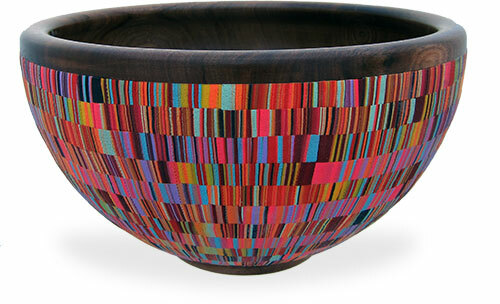 Your bowls are, as always, true works of art and wonderful examples of collaboration. I was fortunate enough to take two classes from Gwen. She was a gracious lady and a talented and effective teacher. She will be sorely missed. If you are new to clay, please take a moment to visit her website and check out her gallery of art. You will be happy you did. Really wonderful colors in this one–I think more really is better for these. I never met Gwen, but I do recognize her influence–she was a light in the polymer world. I was so sorry to hear about Gwen. It was at her French retreat that I spent a wonderful week at Jeff Dever’s workshop. There I met and have remained very good friends with polymer artist Penina Meisels of Santa Fe. Happy days. And Cynthia, your bowl is stunning and I’m pleased to have played a small part. Hats off to you and Blair.